Sometimes it can be extremely easy to forget about caring for yourself. Taking the time to relax and do something for your mind, or even for your body. We get so caught up in our lives and what's going on around us, we forget to make time for ourselves. For example, for mums; making time for yourself is a very rare occasion, as you don't have time to think about yourself while you're ensuring your child is safe, happy and healthy. Although prioritising time to take a long relaxing bubble bath can be rather difficult in life, self care is key to stress management and needs to be a priority at some point during your day or week. Self care makes you feel more effective and energetic to tackle the day ahead of you. It also helps to maintain a healthy relationship with yourself, understanding your needs to keep yourself happy an healthy. While you're maintaining a healthy relationship with yourself, you'll also be creating healthy relationships with others around you. This is done by producing positive feelings which improves and enhances your confidence and self-esteem; inspiring everyone around you to also self care. Self care is such an important aspect of stress management, we're more resilient in our life when we're not feeling stressed and we're able to handle what ever life throws at us when we feel our best! I've definitely found I'm able to do anything, when I'm feeling my most happiest, and without self care, I wouldn't feel as happy as I usually do. You and your needs are important! We all know by having a cared for body, we feel amazingly good! Having a lush bath, a face mask and exfoliating doesn't just make our body feel amazing, but it makes us feel relaxed and refreshed which is the best way to start any day! Not forgetting a coffee which makes our mind feel great too! I am definitely one for taking time for myself and being alone, I do this fairly regularly, nearly every single week and being able to sit on my own or go for a long walk alone does me the world of good! While you spend time doing something which you love, this takes your mind off everything which has been stressing you out and leaves the problems to work themselves out in the back of your mind. Taking time for yourself and spending time alone also lets your body have time to relax through a special treatment which is the most natural way to relieve stress. The best way to do this when you know you'll always be alone; a long soothing bath! So here are my ten tips to self care and learn to self love! Do something which nourishes you. Find something which nourishes you, which also makes you happy! Anything which does require you thinking about work, student life or anything which could potentially stress you out! I personally love going for a walk, reading, blogging, writing, watching Netflix or knitting! Done something absolutely incredible, or something which has made you feel proud? Then praise yourself. Make yourself feel great about what you have achieved and celebrate, even the smallest things! Read books and watch your favourite movies. Reading your favourite books and watching your favourite movies is a great way to fill your mind with joy, while also taking your mind off anything which you're thinking about! When I'm feeling stressed, I love to sit down on the corner of the sofa with a fluffy blanket and read my favourite book! It takes me to a place where I'd love to be. Creating a journal and scrap-booking isn't for everyone, however it is a great way to self care. I absolutely love scrap-booking as it is very therapeutic and helps me to remember all of the occasions where I have been at my happiest! I recently really enjoyed creating a scrapbook of the first year me and my boyfriend had been together, filling it with all of the events we had created together. I loved it and it made me feel so happy with my life! I absolutely love learning, and learning something new is a great way to free your mind and let go of everything bad, while you're learning something good. It helps you to embrace everything you are absolutely incredible at, while achieving something so much better! I realised studying at University and learning something new every single day, has helped me to realise that I have a purpose in life, to help children to achieve and grow! Learning helps you to discover different aspects in life, and you never know what you are going to discover next! Over the past year, the mindfulness colouring books for adults have recently come into stores and they're incredible. By delicately colouring in a stunning picture, you can free your mind by concentrating on something which you can turn into anything you want it too! You can choose the colours, you can choose the way you colour, hard or soft and the picture is yours and however you want it to look. They say the movement of your hands while colouring is the relaxation method which helps you to de-stress. Power naps are called power naps for a reason. Short naps make all of the difference to how you are feeling and usually when waking up from a nap, you feel a lot more energised and ready to complete tasks than how you felt beforehand. It is definitely a "pick me up" if you're feeling down in the dumps and need something to make you feel that little bit more awake throughout the day. Plus, there's no harm in taking an afternoon nap! Spend time with real friends. Friends are perfect for the days when you're feeling down and need someone to cheer you up! I've found real friends always know what to say and they make any situation so much better! Like they say "The best kind of friendships are fierce lady friendships where you aggressively believe in each other, defend each other, and think the other deserves the world." Have a long bath or shower. Baths and showers are the best way to self care! Not only do hot baths relax our body, but they also prepare us for falling asleep a lot quicker! The hot water relaxes our muscles which soothes us physically and mentally, giving us that little peace of mind which we really need! Unfortunately, very few people understand how our body's physical state increases our anxiety. By having a soothing bath, our body not only feels better but it reduces anxiety too. Clutter makes us feel stressed, there's no doubt about it. Occasionally, by doing a mini de-clutter, this helps us to relax in the environment around us as we aim to throw away or donate everything we no longer touch or use. Working in a cluttered, busy environment also isn't good for our heath as it can make us feel worked up and uncomfortable. Do you have a bunch of old things which you have kept since you were at school but you know you'll never touch them again? Get rid of the old, and bring in the new! You never know how great it'll feel until it's done. I hope this has helped you in any shape or form! Let me know how you self care. 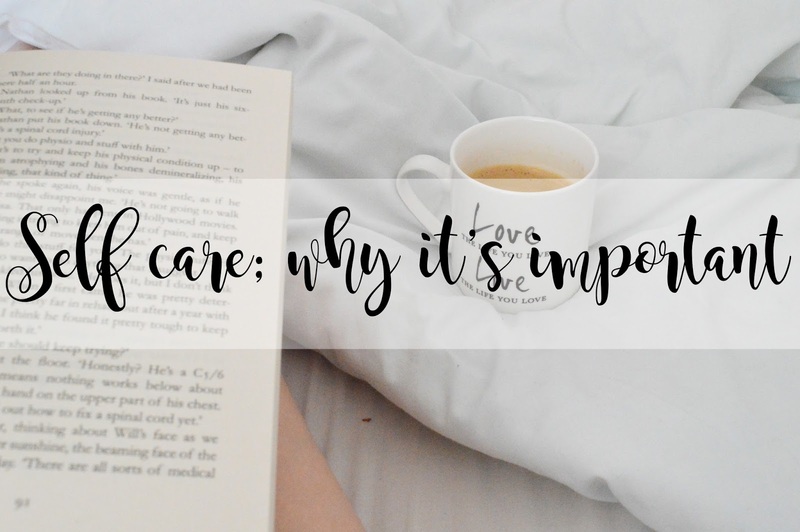 Self care really is, like, one of the most important things - it's where everything else starts, you know :) Great post! Self Care is most important for our wellbeing. I love adult colouring where I'm able to totally switch off and forget about anything stressful.